Here’s a quick dish I threw together last night. I wanted sweet potatoes but I don’t like plain sweet potatoes all that much. I considered a mashed sweet potato, then decided to try something new. As much as I hate to admit good things come out of those frozen meals, one of my favorite things from the frozen diet dinners is a sweet potato and apple mixture with craisins. It’s slightly sweet, the apples and craisins hide the sweet potatoes just enough for me to eat them, and it’s a good flavor alongside turkey, ham, pork or whatever that frozen stuff is next to it. You’ll be surprised how easy this is! It’s a very versatile dish. There are no exact measurements to it, so don’t stress about that. Instead, follow the guidelines in the recipe and adjust for what you have available and what you like. 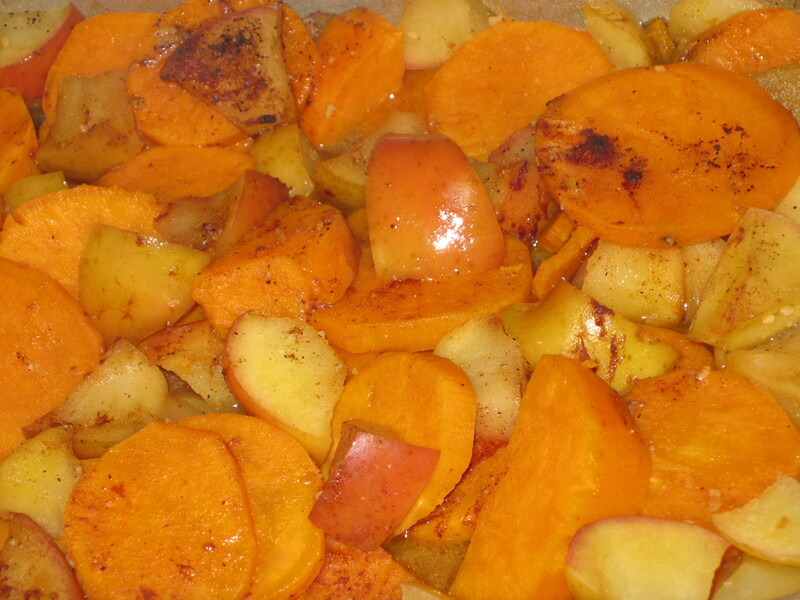 It can be scaled up or down by changing the amount of sweet potatoes and apples. It’s fairly healthy as I made it, but you can make it healthier by reducing the sugar and the butter, although I really didn’t use too much. Click for recipe. This dish put out a wonderful smell while it was baking, the type that is particularly enjoyable on a cold evening. I’m sure I’ll make this again, and will probably make a few adjustments. For instance, I’ll probably throw some chopped pecans on top during the final baking period. I think the contrast of the crunchy nuts with the smooth sweet potatoes would make this even better. Adding craisins to the mix could add some good flavor as well. I may add a dash of salt or a bit of pepper, depending on what I serve it with. I’ll kick up the spice a bit if I’m eating it with something that’s not very spicy; and on the flip side of that, I’ll keep it somewhat sweet if I’m serving it with something that’s highly seasoned. I’m already looking forward to the next time!